In this Uther Build Guide, we provide an overview of his strengths, abilities, talents and matchups. 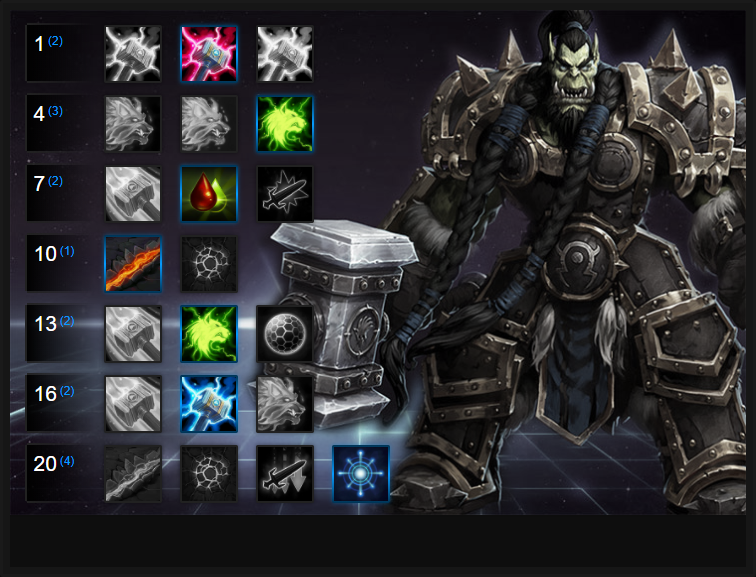 Thrall is a melee assasin that has a large amount of sustain thanks to his trait's ability to heal himself. When at higher levels and thanks to some key talents, he's also capable of dealing eye watering damage to single targets. Thrall is difficult to play at times because he can die incredibly easy if focused and as a result, he requires excellent positioning skills. Outside of Thrall's sustain - thanks to his excellent trait - he has a surprising amount of poke with Chain Lightning. This places him at an advantage over most melee Heroes because he doesn't always have to dive in feet first. Unsurprisingly, this poke also makes him particularly powerful on Battlegrounds that require object interaction (such as Towers of Doom), and ensures he can choose the right moment to attack. Excellent at laning due to his heal and lightning "poke"
Frostwolf Resilience (Trait) - Thrall's Trait is the primary reason why he's such an effective melee assassin. At 5 stacks it provides a burst of instant healing. It helps keep you in lane for a long time without needing to back out, gives you extra power in duels, and can make sure you’re able to sustain throughout a team fight. Just remember that it will not save you if you’re focused as you can't always gaurentee when it'll trigger, as it relies on stacks being obtained from your abilities. Chain Lightning (Q) - Chain Lightning doesn’t really help when you’re looking to burst down a target, but it does help quite a bit with laning phase due to it being a source of poke damage and wave clear. If you choose to take the Echo of the Elements talent at level 1, it will also help keep your mana high, extending your ability to lane almost indefinitely. On objective based maps that require interaction, Chain Lightning is especially good at disrupting the enemy team. The fact Chain Lighting bounces to two nearby targets - from the point of impact - makes it a valuble tool for disrupting objective interaction or finishing off a low health Hero. Feral Spirit (W) - Feral Spirit is Thrall's only form of crowd control and allows him to root multiple enemy heroes at once. With your Feral Spirit having the ability to pass through enemies, all those in its pass with suffer the root for 1 second. Although minions cannot be rooted, each target struck will still grant 1 stack of your trait. Fired through a minion wave, this can instantly heal you. What's also interesting about Feral Spirit is its range is increased for each hero the wolf passes through, allowing you to root the backline if the opposing team is attempting to body block you. Windfury (E) - has two components and they’re both valuable. The movement speed boost (30%) can help you catch up to your target, or to reposition if you’re caught out. The increased speed of your basic attacks however is what really allows you to burst down an enemy, which is what you should be looking to do. If you’re able to get to your target without the movement speed boost, basic attack once before activating Windfury, as the ability will reset the cooldown on your basic attack. It's also worth ensuring that you root your foe with Feral Spirit to gaurentee they cannot avoid your Windfury damage. Earthquake (R) - is a large AoE slow that can be especially helpful during a team fight, but this Heroic should only really be considered if your team has a lot of damage from other sources, as the damage from Earthquake alone is minimal. Also keep in mind that the slowing pulses do not come extremely quickly, so while the duration of the ability is long, Heroes with mobility skills (such as Li Ming's Teleport) can quickly escape. What I will add is that Earthquake is amazing for triggering your Trait as each pulse of Earthquake causes damage to whomever is in the radius and as a single stack per hit, per Hero, you can gain tons of healing in a very short space of time. Not only that, but if used in amongst the enemy team and if you have good follow-up, they'll struggle to escape and you can often secure easy kills. Sundering (R) - offers both damage and crowd control. You can use this ability as part of a combo on a single enemy, or to split off a priority target from the rest of their team to burst them down. You need to be careful with the timing and placement of this Heroic, as you can accidentally save an enemy, or push the wrong one towards your team. That said, it's fairly hard to miss with and the 1 second stun is invaluable for allowing your team to spike down an opponent or to prevent the opposition using a Heoric. Like our Heroes of the Storm content? Help support Ten Ton Hammer by subscribing to us. Here's the details. Despite being nerfed recently, Crash Lightning is still Thrall's best talent at level 1. Allowing him to drastically increase the damage of Chain Lightning, he needs to hit at least 2 Heroes with a single cast. As long as you hit a target surrounded by their team - in or out of lane - it takes around 11 minutes on average to complete. In smaller maps, it can be done in as little as 5. Once maximized, its damage is increased by 360 and it prioritizes Heroes over minions, allowing Thrall to deal massive ranged poke damage. Mana Tide, alongside Echo of the Elements, allows Thrall to sustain himself a huge amount in lane. Each stack of Frostwolf Resilience restores 15 mana and also reduces basic ability cooldowns by 0.5 seconds. When paired with Chain Lightning, and if your level 1 talent Quest is completed, you can remain in lane indefinitely without ever having to return to base. Ancestral Wrath is pretty amazing. Providing Thrall with an active ability that deals 15% of a Heroes maximum health as damage, it also returns 150% of the damage dealt as health, back to Thrall. Not only this, but its cooldown is based entirely on your Frostwolf Resilience stacks. Considering how fast you can stack Frostwolf Resilience, especially with Chain Lightning, you always have Ancestral Wrath available. Sundering has once again returned to be a valuable heroic for Thrall. Offering a brief stun, displacement and damage, it causes massive disruption in a team fight. Fantastic for singling out a player, or protecting an ally under pressure. Variable: During any team fight, Earthquake is amazing for disrupting the enemy team and holding them in place. The fact it triggers your Trait also provides amazing sustain for you if the enemy stays in its radius. The slow is significant and will allow your team to pin down enemies quickly. Grab Earthquake against a melee heavy composition. Frostwolf's Grace allows Thrall to instantly activate his Trait, allowing him to heal for 150% of its normal amount. With a 15 second cooldown, this burst of healing will save your life and gives you amazing sustain. Variable: If you picked up Feral Resilience, or are against a very ability heavy compostion, pickup Spirit Shield. It allows you to reduce ability damage by 50% every 45 seconds, with the cooldown lowered for each Frostwolf Resilience stack you get. Building on your Crash Lightning, Thunderstorm allows Thrall to stack a slow on Chain Lightning, allowing him to slow those hit by 40%. The catch is that you cannot hit the same Hero twice with Chain Lightning, and instead have to rotate it against the enemy team. Even so, it's easy to do and a Hero recently affected by Chain Lightning has a symbol under their health bar, so you know not to target them. Once the quest is completed, Chain Lightning's damage is increased by a further 25%. Just don't die, or hit the same target, otherwise the bonus is lost. Wind Rush allows Thrall to teleport instantly to a nearby location and upon teleporting, he instantly gains Windfury. Whether escaping or following-up on an enemy player, it's a brilliant talent for bursting. Variable: Dealing 20% extra damage and snaring on your basic attacks is significant and thanks to Nexus Blades, you'll pretty much wreck anyone at this point. These Hero Threat Levels (1 being lowest threat and 10 being highest threat) are to help you determine which enemy Heroes can give you a headache. For the Heroes listed here, take extra care as they're particularly dangerous for Thrall. Brightwing: Brightwing is a threat in the sense that her Polymorph combined with Emerald Wind can significantly harm your ability to get to the backline of the enemy team. If you can, wait in the wings until the right moment. The Butcher: Although you can heal, it's not comparable to The Butcher's. His Silence on Hitching Post can also wreck you. Jaina: Her slows make her a formidable opponent. If you can dodge her Frost Bolt and root her, she's in trouble. Raynor: His self heal, similar to your own, is annoying. His knockback even more so. Sonya: A challenging matchup because of her health regeneration. If she has taken a Seismic Slam build, it'll depend entirely on who lands the first attack and if you can trigger your heals quick enough. Tychus: His mobility combined with high attack speed make him challenging, especially if he avoids your first root. Valla: Annoying to fight against because of her poke range and slows. Her Vault also ensures she can easily avoid your root. Xul: His root combined with his attack speed reduction makes him a huge headache, even more so if he takes Vulnerability on cast and reduced healing on Scythe. Avoid and poke from afar. This list of tips and tricks are just a handful of things we think will help your Thrall play. We'll continue to add to the list as required and if you have any tips you'd like to share, let us know in the comments below and we'll place them here. 1. Always try to prime your Frostwolf Resilience before you go into combat so that when you use your skills, you'll time your heal. 2. Frostwolf Resilience stacks are awarded based on the number of enemies hit. For example, Chain Lighting can hit 3 targets providing a total of 3 stacks. Use this to determine when you need to heal. 3. To quickly trigger your Frostwolf Resilience healing, you can use Feral Spirit through a minion wave to heal instantly. 4. Chain Lightning triggers your Frostwolf Resilience PER bounce. It's a good idea to try to ensure that when retreating, you can secure a heal by firing at a single player (and those nearby). 5. Chain Lightning is pretty mana heavy early game. Use it to poke, but not too often. 6. Try to always save one charge of Chain Lightning towards the end of a team fight so you can poke someone down if they're low health and trying to escape. 7. Always try to focus squishy targets first by using your Feral Spirit to engage. 8. If someone is running away from you, try to aim Feral Spirit slightly ahead of them so it guarantees they're rooted. 9. If you need to run away, you can always use Feral Spirit defensively by turning, firing, hitting Windfury before escaping. 10. Always try to land Windfury against squishy targets. It deals massive, rapid damage and is your highest burst attack. 11. It's often best to save Sundering for when a fight has already started. If enemies are medium to low health, it can often cause enough disruption to turn the tide in your favor. Thanks for reading our Thrall guide! You can now help support Ten Ton Hammer, so we can keep writing guides like this.